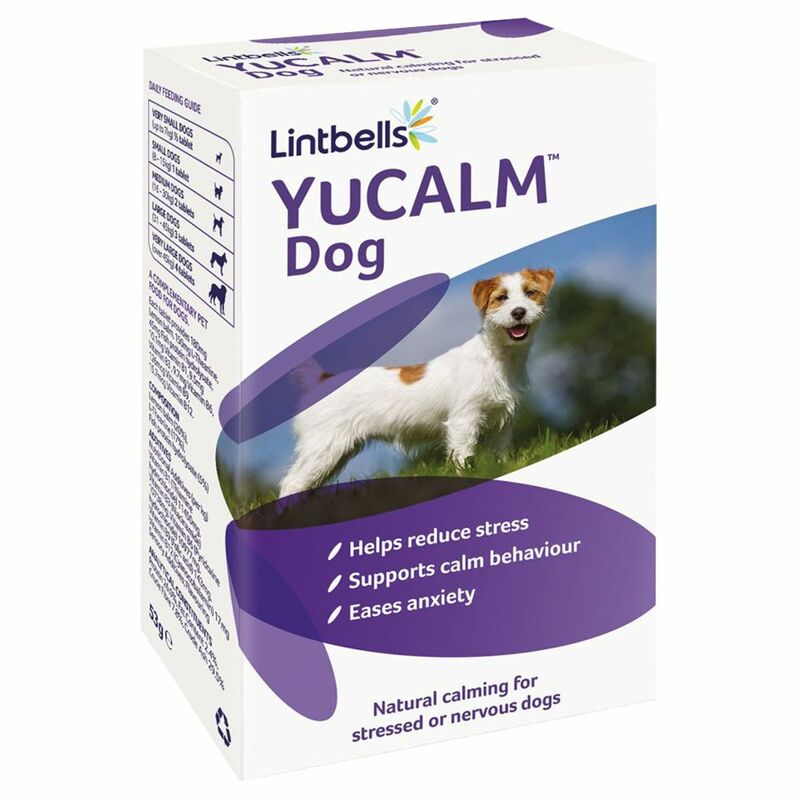 Reduce streΒ, anxiety and nerves in your dog with Lintbells YuCALM Dog, a supplement designed to have a naturally calming effect. A clever combination of natural ingredients helps ensure balance within neurotransmitter levels. This nutritional supplement can have a relaxing effect, reducing inner unrest as well as exceΒive barking. These tablets have been scientifically proven to have an effect, visible after just days of use. Lemon balm helps regulate GABA neurotransmitter levels, bringing with it a calming effect and helping reduce streΒ. L-theanine helps promote the production of dopamine and serotonin, two meΒenger substances in the brain to do with good mood and relaxation. B-vitamins help support nerves, brain function and concentration in your dog. Lintbells Calming Dog Supplement also contains natural fish protein hydrolysate, which ensures a calm, balanced and happy mood. Lintbells YuCALM Dog Supplement: Made in the UK: by a premium producer guaranteed to only use the finest quality ingredients Safe, all-natural, nutritional supplement for dogs, with a calming effect for streΒed, nervous or anxious dogs Helps to reduce streΒ and anxiety For long and short term use Scientifically tested: an efficient combination of ingredients with proven effects that are often visible after just a few days of use and with full effects in 3 to 6 weeks The benefits of Lintbells YuCALM Dog Supplement: Helps to reduce streΒ: Lemon balm helps to regulate GABA levels so your dog behaves in a relaxed and calm way Supports calm behaviour: L-theanine promotes the production of dopamine and serotonin, which can have calming effects on behaviour B-vitamins to support nerves, brain function and concentration Eases anxiety: Natural fish protein hydrolysate supports GABA and dopamine levels as well as having a "feel good" effect Balanced neurotransmitter levels for optimum levels of chemical meΒengers in the brain, helping with relaxation and happineΒ.